problematic in recent years.Johnson Controls is under contract with Pfizer to provide process control and maintenance services a this site, and is responsible for upkeep on this 8 acre lake. 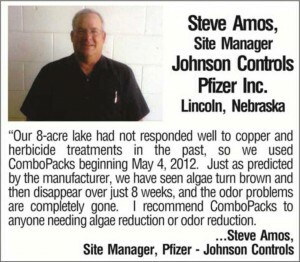 In the last several years, the site manager, Mr. Steve Amos, has utilized a variety of algae control methods, such as copper sulphate and herbicides. Despite these efforts, the lake condition has continued to deteriorate. 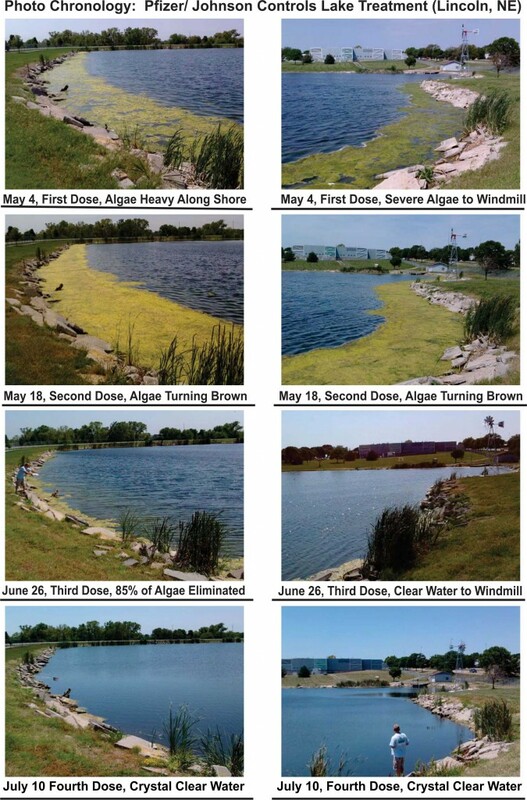 By late April 2012, particularly with an unusually warm spring and abundant sunshine, the lake was highly odorous, and was 30 to 50% covered with algae. Because past chemical and physical treatments proved ineffective, Johnson Controls / Pfizer elected to use the Bio Lake Clear and Ecosock System, distributed by Organic Earth Solutions LLC in New Jersey. ComboPacks. ComboPacks include a liquid bacterial concentrate (Bio Lake Clear) plus a slow release powdered bacteria / nutrient mix (Bio Lake EcoSocks). 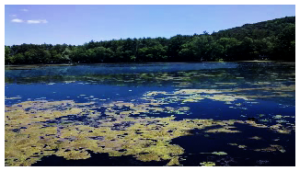 is ultra-concentrated, with a mix of nitrifying and denitrifying bacteria that out-compete algae for N and P nutrients. EcoSocks consist of freeze-dried, sludge-reducing bacteria and food grade nutrients encased in a biodegradable sock. When placed into water, the EcoSock continuously produces sludge-digesting, algae-fighting bacteria for a full one month. After one month, the EcoSock is removed, discarded as yard waste, and replaced with a fresh Bio Lake EcoSock. Together, Bio Lake Clear plus EcoSocks make up the ComboPack. ComboPacks are designed for once a month application. excess algae was eliminated, the water clarity was superb, and odors were completely gone.